The schedule for the Midwest Championships is posted and has been slightly revised. The starting times on both Saturday and Sunday remain the same. However, there are slight game time changes on Saturday’s schedule. Visit the “Schedule” page for more details. Nationals will be hosted by Ohio State University at the SPIRE Institute in Geneva, OH! Click here for more information. We are extremely happy to host you for the 2014 Irish Invitational! If at any time over the course of the weekend you need assistance or directions, please do not hesitate to ask any one of our players. Below is some necessary and important information regarding the weekend. 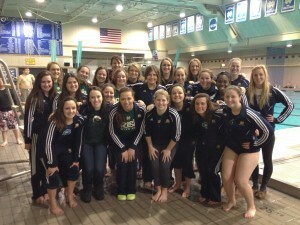 – The NCAA is hosting the Women’s Basketball Regional at the Joyce Center (building pool is attached to) on Saturday. Therefore, we suggest and would love if all guests could please park in the B2 Library Lot on Saturday and walk down Leahy Drive to the pool. Friday and Sunday the C1 Lot will not be as hectic. – The entrances to the pool are located on the north west corner of the pool. There will be separate team and spectator entrances. These entrances are the only way in and out of the pool this weekend. Please adhere to the signs posted throughout the pool. – There are several places on campus within walking distance of the pool for meals. The first is Legends of Notre Dame (click walking icon for direct path from the pool), which is a casual dining restaurant with a Notre Dame theme. The second is the LaFortune Student Center (click walking icon for direct path from the pool), which has a Subway, Taco Bell/Pizza Hut, Burger King and Starbucks. – If you would like to go off campus for meals, there are many choices. There are many options on Grape Road and Main Street in Mishawaka. There are also a selection of restaurants directly South of campus at Eddy Street Commons including Chipotle, McAllisters Deli, Five Guys, Jamba Juice and Hotbox Pizza. Thank you all for making the trip to campus! We’re looking forward to a fantastic weekend of water polo! There have been a few changes to the schedule for this weekend at the MSU Tournament with regards to game times. Please visit the “Schedule” page for more details! Go Irish! Will you see the Fighting Irish in action this season? Check out our schedule page to see which weekends will work for you this year! Be sure to check periodically leading up to any specific tournament for travel details and specific schedules of games. We look forward to seeing you all and hearing your loudest cheers! Go Irish! Welcome to the home of the University of Notre Dame Women’s Water Polo. We are a club team, competing in the Collegiate Water Polo Association’s Midwest Conference. In our 2013 season, we placed 9th in the nation and took the title of Midwest Champions. This was the seventh consecutive time the team has won the Midwest Conference and the team’s sixteenth consecutive appearance at the CWPA Conference Championship – a national record. We practice year-round, Monday through Thursday from 8:30pm – 10:45pm at Rolfs Aquatic Center. Any female student in good standing, undergraduate or graduate, may participate. If you are interested in the program or have any questions, please contact us.